Featured Crafter – Mod Podge Rocks! 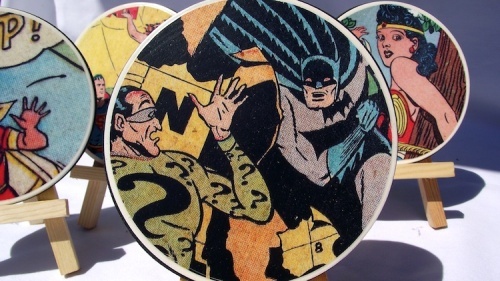 DIY Geek Coasters on Mod Podge Rocks! I am a 34-year-old transplant from Seattle living in Atlanta, Georgia. I was born from creative genes, so I’m carrying on the tradition. I have been knitting for 18 years, sewing for longer and decoupaging for just a few. I do all of these things on a daily basis, or at least as much as I can. In addition to Mod Podge, I love the color blue, dogs, reading, cold weather, funny movies, road rallies, yogurt, garden gnomes, sock monkeys, running, tattoos, being outdoors, buttons, snuggling and apparently blogging. Who knew I would love it this much? My favorite thing about Mod Podge Rocks! is that I get to bring lots of ideas and inspiration together in one place – making everyone who is featured here an authority! I started this blog because when I was trying to find decoupage inspiration, I had to go to a lot of different places to get it. I thought, “what if it could all just be in one place?” I don’t just complain people – I make it happen! Interested in being a “Featured Crafter”? We want to hear from our crafty friends about what they like to create. Share with us what you put your energy into, whether it is your passion, your business, or simply something you enjoy doing. Do you have your own blog, Etsy store or craft products? Tell us about it! Click here to submit a “Featured Crafter”! This entry was posted in Crafts and tagged Craft Professionals, Featured Crafter on October 6, 2011 by CreateForLess.